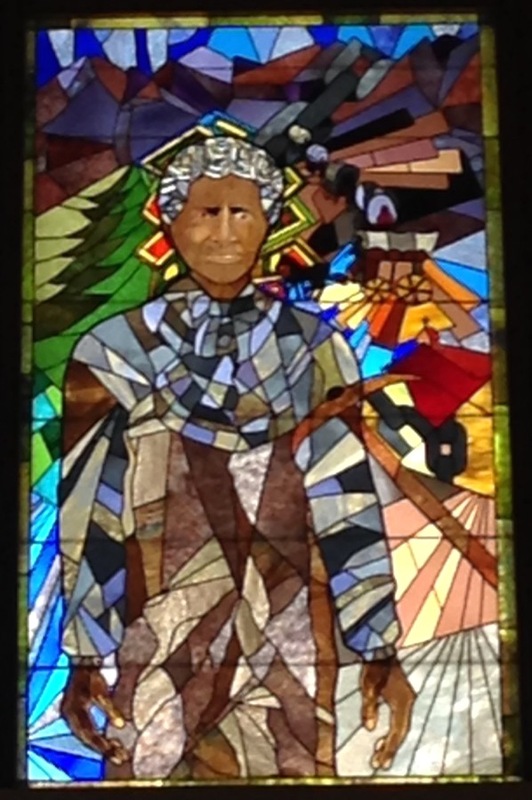 How often have you sat in the Old Supreme Court Chambers and wondered, “Who are those people in the windows?” As it turns out, each window honors persons who played a significant role in the history of various ethnic and racial groups in Colorado. The Heritage Windows on the north wall of the old Supreme Court chambers were a gift from the committee that organized the centennial celebration for Colorado in 1976 to honor four ethnic and racial groups – Hispanics, Native Americans, African Americans, and Chinese and Japanese. Members from each group designed the stained glass windows, and the Elysian Glass Company manufactured each window for about $6,000. The windows honoring the African American and Hispanic communities were presented to the state on January 7, 1977, and those honoring Native Americans and Chinese and Japanese communities were dedicated on February 18, 1977. Dominguez and Escalante were Franciscan monks who led an expedition through the uncharted West in 1776. 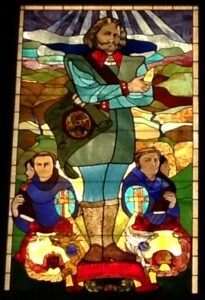 The expedition’s cartographer, Don Miera y Pacheco, is the dominant figure in the window. Pacheco drew up maps and kept a detailed diary of the Dominguez-Escalante expedition that started in Santa Fe, New Mexico, and traveled up through southwestern Colorado to the Great Salt Lake in Utah, and southwest to Monterey, California. The expedition explored more unknown territory than Daniel Boone or Lewis and Clark, though it never met its objective of finding a new route from Santa Fe to Monterey. Carlotta Espinosa designed this window, located on the far left-hand side as you face into the Old Supreme Court Chambers. 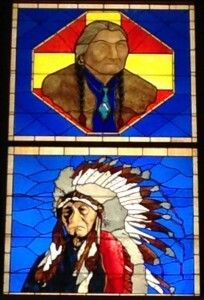 The upper half of the window honors Chief Jack House, the last hereditary chief of the Ute Mountain Ute tribe. In his over 30 years of leadership, Chief Jack House worked to secure essential water rights for his tribe, fought for the tribe’s right of self-determination, pushed for improvements of their living conditions, and lobbied for their causes. He helped establish the tribal council, the Ute Mountain Tribal Office, and the blueprints for the tribal constitution. Norman Lansing of the Ute Mountain Ute tribe designed this portion of the window, located directly left of the center window. 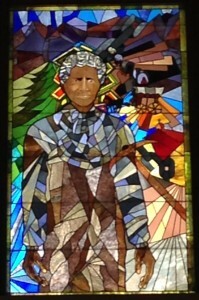 The lower half of the window depicts Chief Buckskin Charlie, the last hereditary chief of the southern Ute tribe. Chief Buckskin Charlie, often called “Charlie Buck,” was known as a pacifist leader who mediated peaceful negotiations between the Native Americans of Colorado and the Native American Agency and arranged peace talks in Washington alongside his predecessor, Chief Ouray. Before becoming chief of the southern Ute tribe in 1880, Charlie Buck was stationed with the Federal troops at Fort Junior and was honorably discharged. As a Ute chief, he carried out Ute traditions and ceremonies and introduced new methods of farming, education, and health care to his people. 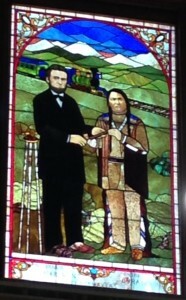 Eugene Naranjo of the southern Ute tribe designed this portion of the window. The center window in the Chambers is not one of the Heritage Windows. It was a gift from a descendant of Alexander Hunt, the Fifth Territorial Governor of Colorado. Governor Hunt negotiated various peace treaties with Colorado’s Native American tribes, including the Ute Treaty of 1868 with Chief Ouray of the Ute Mountain Ute tribe. 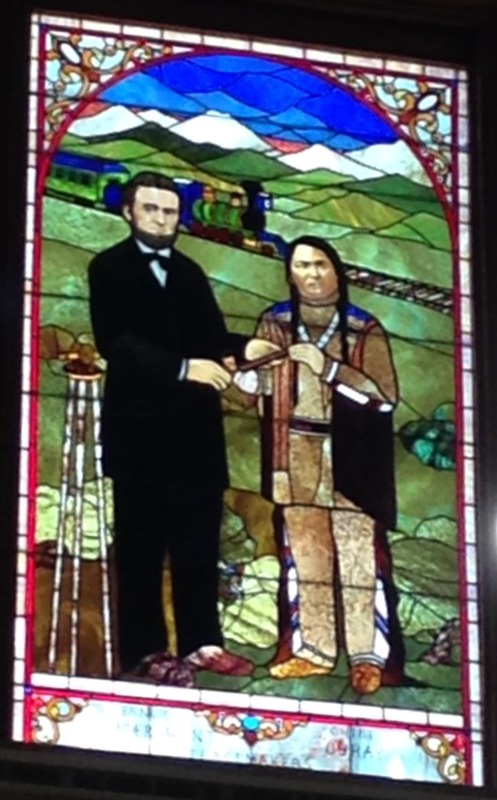 In the window, the two leaders share a peace pipe, a symbol of the efforts to establish peace between the white settlers of Colorado and the Native Americans. Senate Joint Resolution 76-32 authorized the installation of the window, which replaced a window portrait of Chief Justice Robert Wilbur Steele. Clara Brown was sold into slavery at the age of three and was married and gave birth to four children at age 18. She and her children were sold and separated in Kentucky. Brown was emancipated in 1856, after which she sought to find her children. She worked as a cook in St. Louis and then washed and cooked for 25 men to pay for her transport to Colorado in 1959, where the gold rush gave prospects of wealth. Brown settled in Central City, where her home became a hospital, hotel, and refuge for all. She helped organize Methodist Sunday school classes at the First Methodist Church in Central City as well as in Georgetown and Denver and aided other African Americans in making their way to the West with the money she earned. She also worked in various ways to help the miners of Central City. After saving up $10,000, Brown went back to Kentucky in 1866 to find her children. She found her daughters Margaret and Eliza Jane. She could not find her son Richard, and her third daughter Palina Ann had died at age three. Vernon Rowlette designed this window, located directly right of the center window in the Chambers. 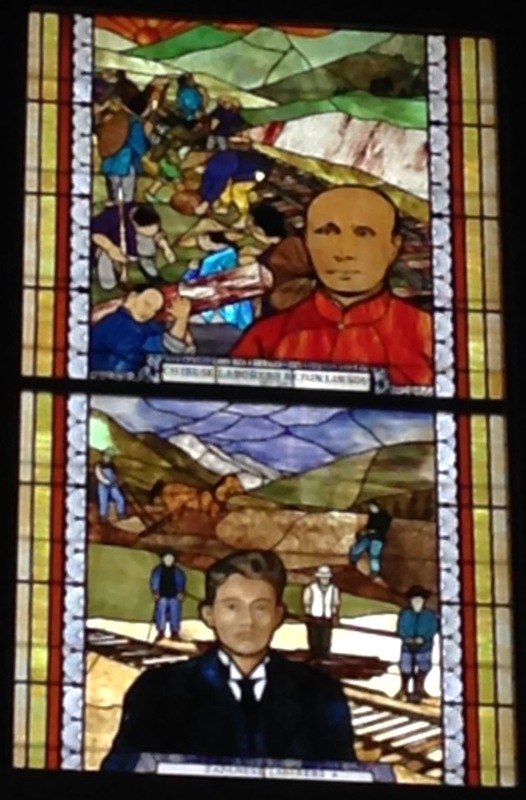 The upper half of the window on the far right of the Chambers depicts Chin Lin Sou, a labor contractor responsible for bringing the first Chinese laborers to the United States for construction work. Chin Lin Sou, nicknamed “Willie Chin,” came to the United States from Canton, China, at age 22 to work on the Kansas Pacific Railroad. He supervised the work of Chinese laborers on the Central Pacific and Union Pacific railroads as well as over 300 Chinese miners in Gilpin County. Willie Chin was one of the founders of the Six Companies and the Chinese Trading and Insurance Companies, which sold supplies to his workers. In 1870, Willie Chin became the first mayor of Denver’s Chinatown, Hop Alley, which was razed in 1950 and no longer exists. He helped his people get jobs and establish businesses and defended them against tremendous hostility, including the anti-Chinese riot in Denver on October 30, 1880. 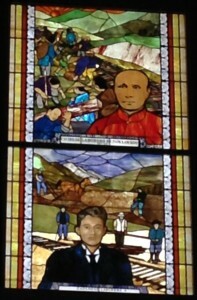 Chen Ting-Shih designed the window. 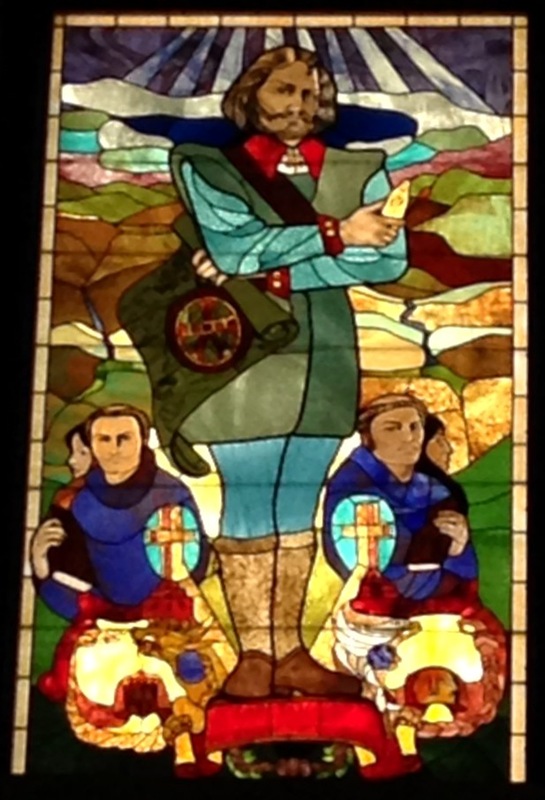 The lower half of the window depicts Naoichi “Harry” Hokazono, a labor contractor who brought Japanese workers to build much of Colorado’s agriculture, mining, and construction industries. His first venture was to bring 70 Japanese laborers from Wyoming to cultivate sugar beets in Colorado. Eventually, he hired 2,000 men in agriculture, mining, and constructing dams and high-tension transmission lines. Hokazono came to San Francisco from Kyushu, Japan, at age 11, and arrived in Colorado in 1898 at age 25. He served as president of the Japanese Association of Colorado, the Japanese Businessmen’s Association, and a printing company that published a Japanese-language newspaper. The window was designed by Yuri Noda, a Denver resident who was born in Japan. Information in this article can be found in “Memorials and Art In and Around the Colorado State Capitol” by the Colorado Legislative Council (June 1992) and “Our Colorado Immortals in Stained Glass” by Elaine Abrams Clearfield (June 1986).